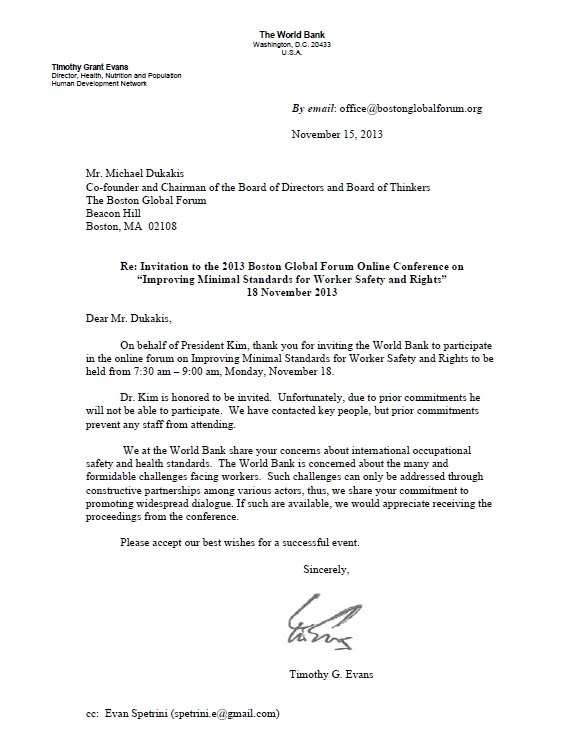 From the World Bank’s Timothy G. Evans – Director of Health, Nutrition and Population has sent us the following letter. On behalf of President Kim, thank you for inviting the World Bank to participate in the online forum on Improving Minimal Standards for Worker Safety and Rights to be held from 7:30 am – 9:00 am, Monday, November 18. Dr. Kim is honored to be invited. Unfortunately, due to prior commitments he will not be able to participate. We have contacted key people, but prior commitments prevent any staff from attending. We at the World Bank share your concerns about international occupational safety and health standards. The World Bank is concerned about the many and formidable challenges facing workers. Such challenges can only be addressed through constructive partnerships among various actors, thus, we share your commitment to promoting widespread dialogue. If such are available, we would appreciate receiving the proceedings from the conference. Please accept our best wishes for a successful event.